During law school, aspiring biglaw attorneys usually spend their second summer interning at a law firm they hope to call home. Although they’re not attorneys, they’re called summer associates and treated quite well. There are activities aplenty, along with the usual work. One of the activities during my summer was a family feud-style game for which we had to answer questions beforehand to populate the answers. One of the questions was, if you could be something other than an attorney, what would you be. My answer? A park ranger. I realize that for many reasons this is not a good fit for me at this point in my life – what with no science degree and no desire to move around frequently during the start of a new career. Instead, I simply enjoy my time outdoors and in parks, doing and learning as much as possible. Craters of the Moon National Monument was the perfect place to do this. Though a National Monument and not a National Park, we found that the facilities, ranger-led activities, maintenance, and services offered at this park were fantastic, the best we’ve seen on this trip. We stayed for three nights and took advantage of this time to go on a number of great hikes, attend three evening ranger programs (at least I did, while Alan stayed back at the site to watch the sleeping babe), attend a ranger-led walk, and attend a junior ranger program. We had thought that Van was too young to attend this program, as most of the junior ranger programming in parks is geared to children at least four to six years old. The traditional junior ranger program (receive a packet, complete a bunch of activities through exploration in the park, and present the packet to a ranger for inspection) at Craters of the Moon is for older children, but a ranger came by our site and invited Van to the evening program, saying that he’d enjoy it even though he’s younger than most who attend. And enjoy it he did! He had a blast, sitting up front and raising his hands for lots of activities. 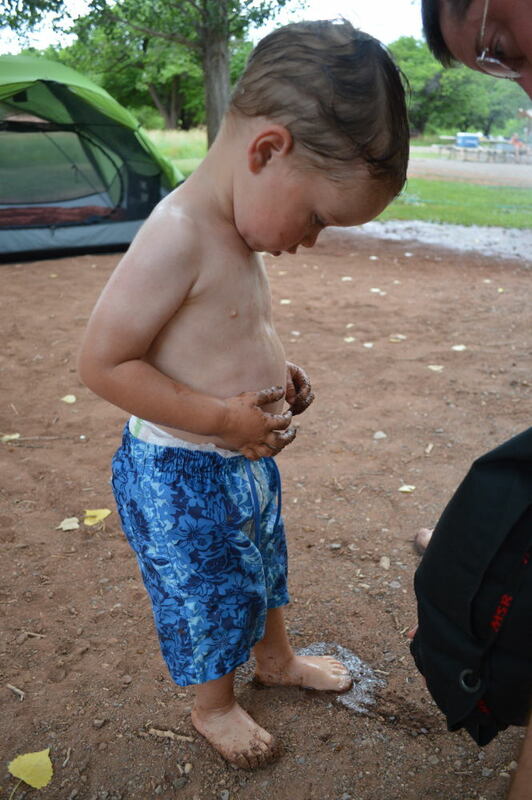 His favorite part was using the magnifying glass to examine items found around the amphitheater. My favorite part was the induction ceremony for all the junior rangers at the close of the program. Alan says that using the term “induction ceremony” is a bit too formal, but it was a ceremony and he was inducted as a junior ranger at the park, so I think that’s precisely what it was. All the children stood up on stage and had to raise their right hand and repeat an oath. Van didn’t do so well on the repeating, but the ranger made sure that his right hand was raised the entire time. At the close, each child received a badge, which Van continues to wear. 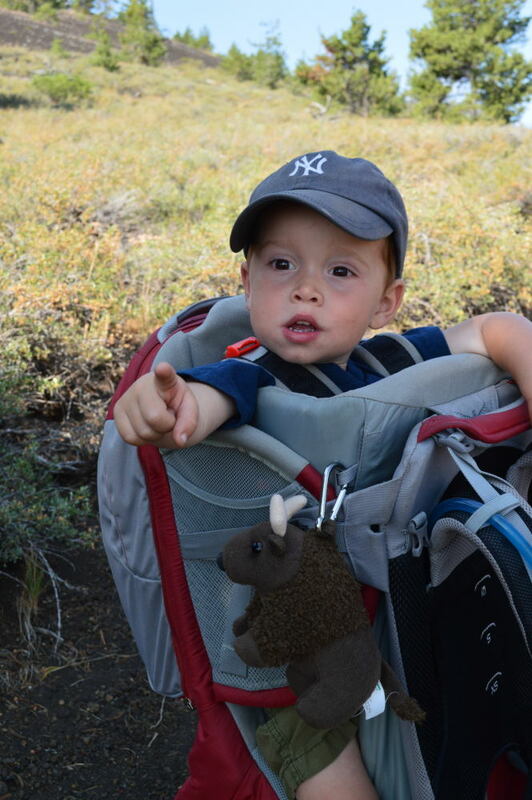 Whenever we ask him what a junior ranger says, he says proudly: “Stay on Trail.” He’s now super vigilant about keeping us on trail and often lets us know his motto whenever we’re out hiking – or frankly, even when we’re not out hiking. Sadly, I didn’t bring my camera to capture the magic, but you can just imagine a squirmy Van on stage, his hand in the ranger’s, beaming proudly amongst a line of older children. The only thing that would have made it better is if Van’s Uncle Jack was there to see it. My brother had an infamous experience becoming a junior ranger at Devil’s Tower, showing up to turn in his completed packet with a massively bloody leg that resulted from a top-speed run in the park. As we were reading aloud the junior ranger rules with the park ranger in hopes that we both qualified for our badges, we quickly learned that one of the important rules was that “Junior Rangers Don’t Run.” Luckily, they didn’t hold Jack’s accident against him, and we were both sworn in as junior rangers. Van has illustrious company! This way. Stay on trail! 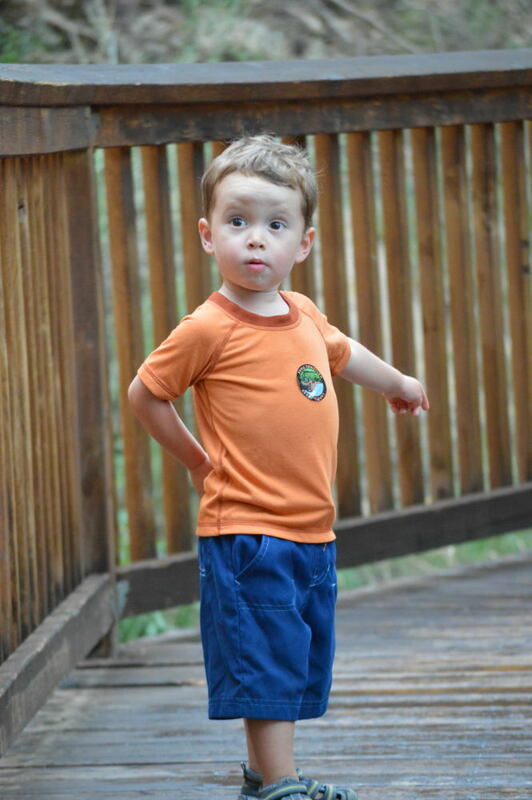 All this talk of “ranger this” and “junior ranger that,” and I haven’t said much about the park. We loved it – absolutely loved it. It’s not every day that you get to visit massively large lava fields and volcanoes aplenty. We even slept on lava. Basically, for three straight days, we were constantly standing, walking, sitting, sleeping, and eating on lava. The park has two main kinds of lava: áa and pahoehoe. The áa lava is larger, rockier, and more jagged and the pahoehoe is smoother and looks more like what I think of as a stereotypical lava flow. 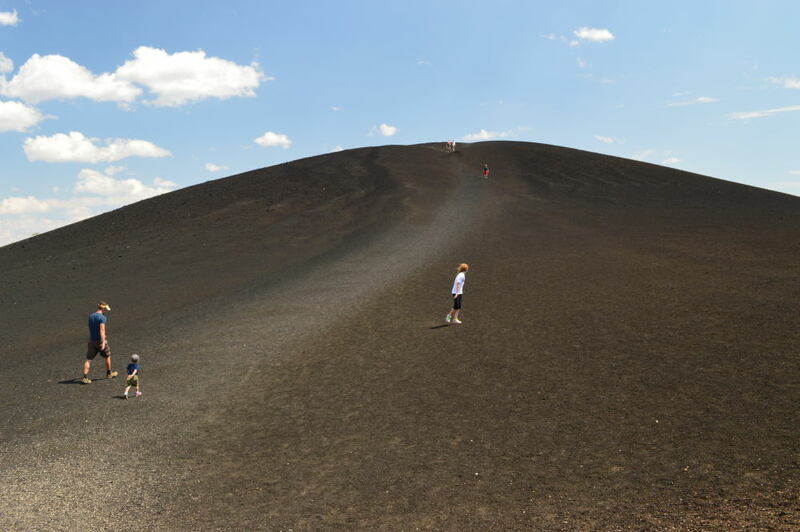 In addition, there were large cinder cones in the park, essentially large mountains of cinders, and spatter cones. These were my favorites, both to see and to hike to and around. Walking on cinders is a completely different sensation. They’re pieces of volcanic rock, but they’re fragile and they crunch beneath your feet. Weirdly, I loved the sound and feel of walking on the cinders and can’t relate it to anything else I’ve ever walked upon. Luckily, the parks has many great trails, because without well maintained trails (almost all surfaced with cinders), your shoes would quickly get eaten up by the lava. The lava, which looks black at first glance, has a thin glass coating on the outside, which both makes it sharp and colorful. 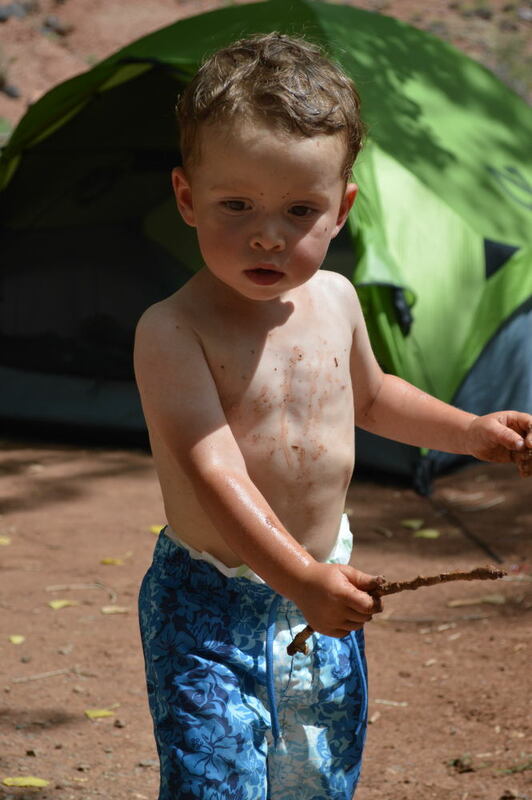 Good thing we also had the little guy eager to repeat his new mantra, Stay on Trail! Most intriguing to me was the various textures and surprising colors in this charcoal-looking landscape. 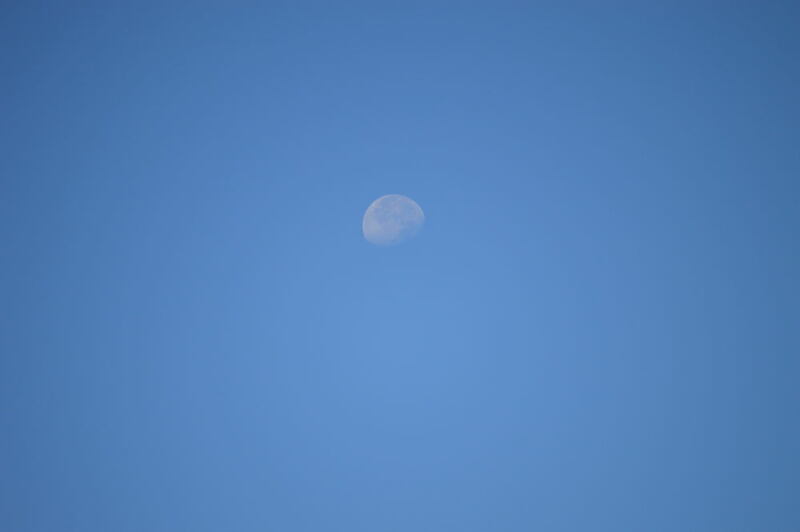 I tried to capture a few examples in the photos below. I like to refer to the photo of brightly colored lichen as nature’s graffiti. 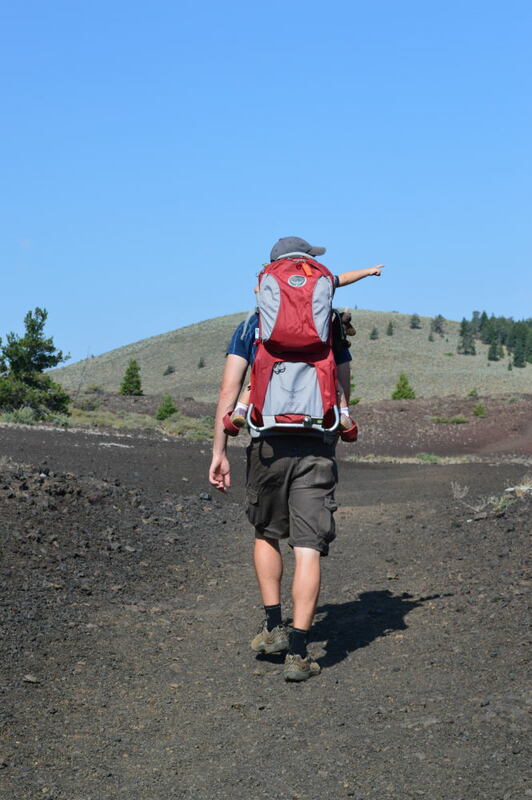 Craters of the Moon may be out-of-the-way in south-central Idaho, but it is well worth a visit. Though many folks come through for the day, if you have the time, spend a few days there to explore all the different types of volcanic formations, including the lava tubes. Unfortunately, we weren’t able to go inside any of the lava tubes because we were wearing the same hiking shoes we had worn on our visit to Mammoth Cave in Kentucky earlier this year. Given the rapid spread of white nose syndrome, which has a very high fatality rate for bats, you could only explore the lava tubes if you were wearing clothing and shoes that had not been in any caves since 2005 or if these clothes or shoes were properly decontaminated. I never did get a full understanding of what proper decontamination would entail, but we knew that whatever it was, we certainly didn’t meet the standard. Our five days in the Salt Lake City area were full of non-stop fun, such as having our car serviced, doing laundry, going grocery shopping, returning Alan’s faulty ground pad and replacing it with a Therm-A-Rest, and dealing with gnawed-through electrical wires on our car. 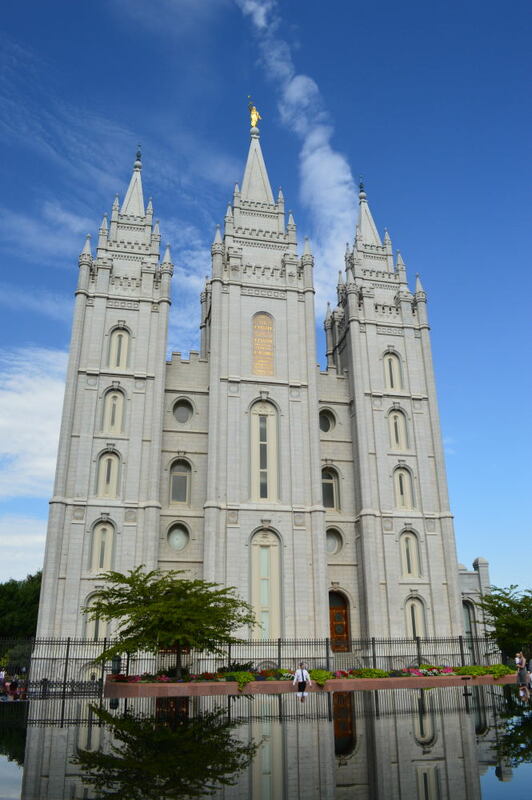 Between all of the errands we were running now that we were in the first urban area we’d seen in quite some time, we also made time to visit Temple Square – checking out the Mormon Tabernacle, a Mormon history museum, and the outside of the Temple. 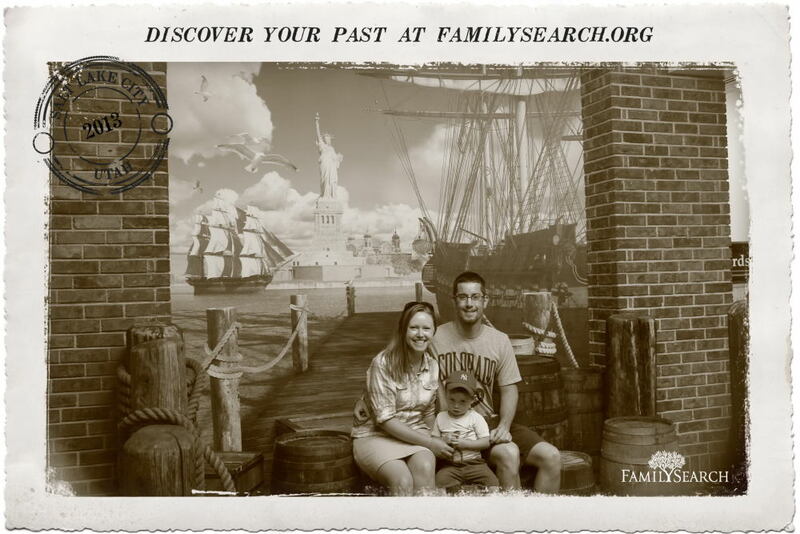 The highlight was visiting the family search center to do some research on my family’s history. My father is knee-deep in researching our family’s history, but he hasn’t done that much research to date on one of my great-grandparents, who happened to be Mormon. I had a great time working with a volunteer at the center to learn more about my great-grandparents and to pull old census records. Even better, I learned that there are family search centers all over (check out familysearch.org for one near you), including one that is not all that far from my parents’ church. Hopefully this will help my dad in his quest to continue compiling our family’s history. In addition to checking out the city and surrounding areas, we also took a trip up to Park City, watched ski jumpers train at the Olympic Park, and camped on an island in the Great Salt Lake. Antelope Island (we did see antelope!) is a largely undeveloped state park in the middle of the salty sea of northern Utah. The sunsets were gorgeous and were reason to celebrate as it was the only time the temperature in the park was close to appealing. I’m not sure if it’s always this hot in SLC in the summer, but the temperatures were pushing 100 just about every day. Van and I did get our feet wet, but the smell and feeling of the slimey sand beneath our feet was less than attractive. As much as I was tempted to float in water five times saltier than the ocean, I took a pass. On the positive side, we only had to suffer through one night of our closest neighbors in the campground setting up an outdoor movie theater complete with spotlights for a midnight showing of a film that we thankfully couldn’t hear over the sounds of their 1970’s-era generator that had definitely seen better days, which powered the whole set-up. But it was all worth it for the absolute best sunsets of our trip thus far. Each night was a spectacle of deep oranges and reds shining across an almost perfectly still sea that appears to merge with, more than reflect, the land around it. No, we didn’t hop a jet across to Europe. No passport was needed to find ourselves surrounded by Europeans on holiday during our tour of the national parks in southern Utah. While it’s common to see non-US visitors when visiting national parks, this was a whole different ballgame, especially in Arches and Bryce. 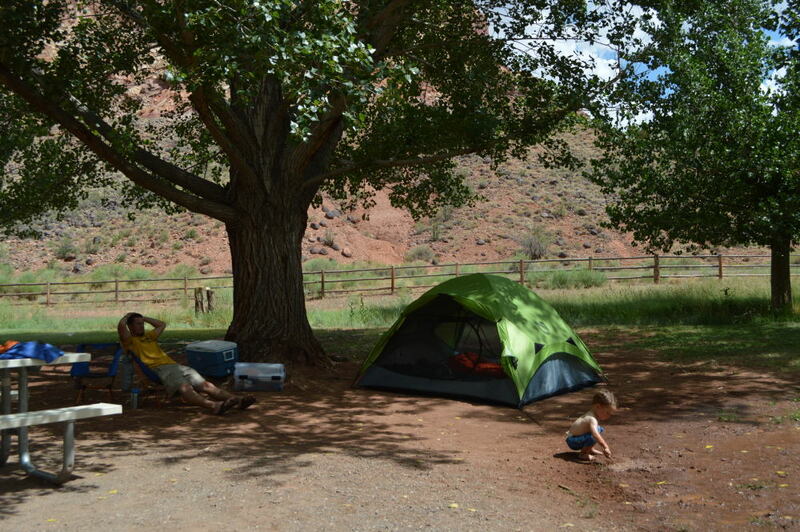 Many visitors seemed to be on an extended holiday, touring a circuit of parks in their rental RV or with their tents and kids in tow. I completely understand why someone may be possessed to fly so far to see some of the US’s more remote parks. Each of the parks we visited in southern Utah – Arches, Canyonlands, Capitol Reef, Bryce, and Zion, as well as our drive through Grand Staircase-Escalante National Monument – was wacky and different and is the closest I’ll ever come to stepping foot on an alien planet. 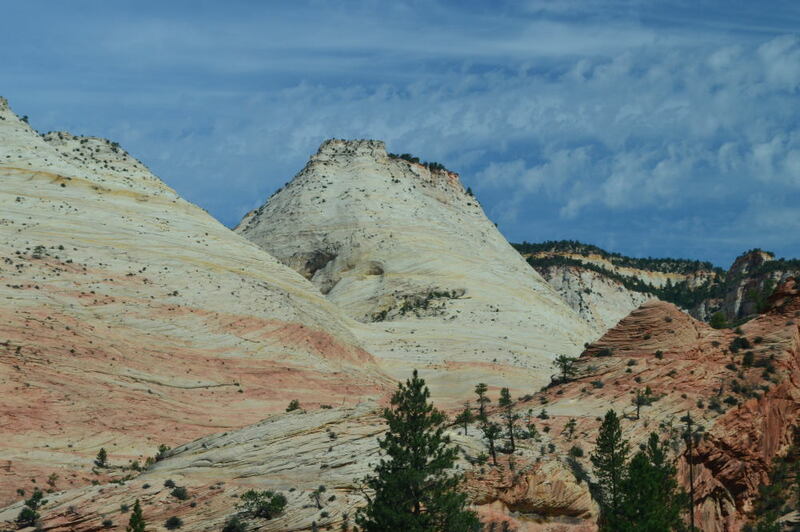 Making our home base to visit Bryce and Zion in one of Bryce’s forested campgrounds, we felt like we’d escaped our alien abductors and returned to a more normal landscape, that is until we got our first glimpse of what makes Bryce so famous. It was like a fairyland, Dr. Seuss’s version of Disneyworld, and a hot, dry Mars, all rolled into one. In short, it was crazy beautiful! 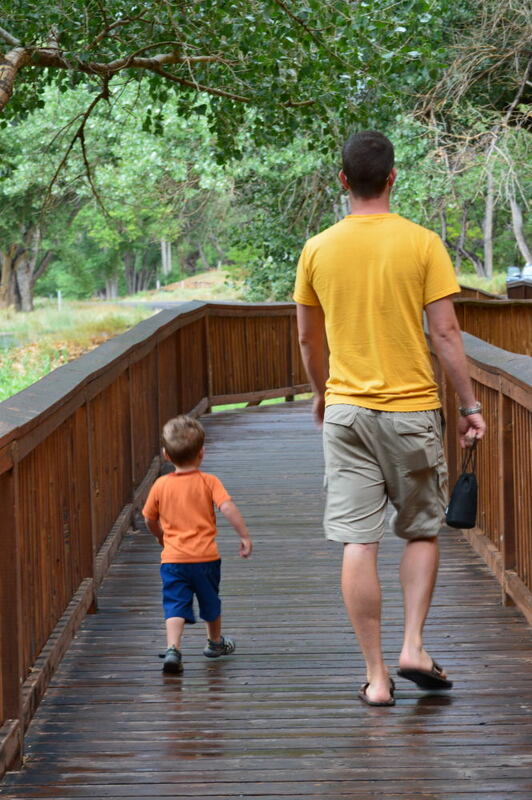 Because we had several days in the park, we were able to check out all the different parts of the park and go on our longest hike yet with the little guy. Just over eight miles down into the amphitheater and up and down and around the hoodoos, and up and down some more. Huge props to Alan who carried the little guy on his back during the entire sunshiny hike. Even more credit is due given the significant number of climbs and descents we had to do during those eight miles. For those looking to replicate our fantastic hike, we hiked from the North Campground to the Rim Trail, along the Rim Trail to the Queens Garden Trail and down into the canyons, then around the Peekaboo Loop Trail (our favorite part) before heading up and out of the canyons along the Navajo Trail, back to the Rim Trail, and onwards to our campsite. The first few miles of the hike were on a popular trail. The views were beautiful, but we were never alone. Once we headed further down into the canyon, we were able to escape the crowds and see the most incredible views. Around each corner we’d keep exclaiming that these were the best views yet, until we turned the next corner and repeated ourselves, and on and on. 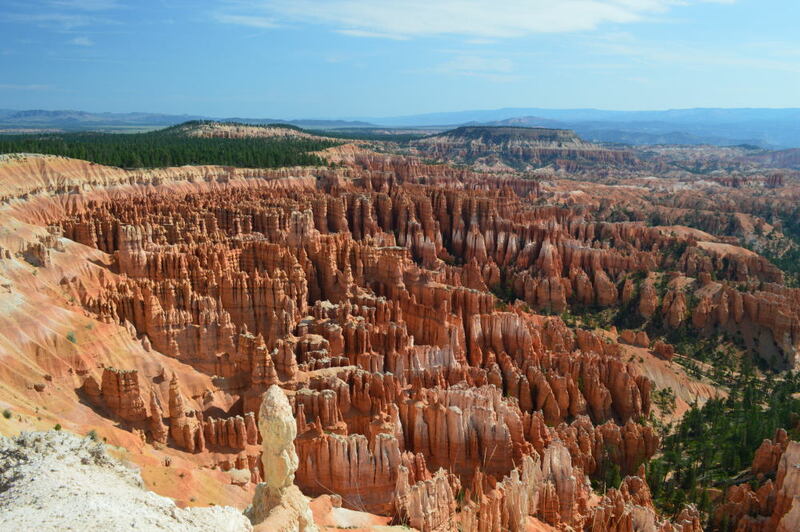 Walking down amongst the hoodoos was something I’ll never forget. There was something magical about being down there. It was almost unbelievable that a landscape like this even exists – I kept reminding myself that I wasn’t dreaming and that the earth is full of wondrous surprises. After seeing this, there is probably nothing I wouldn’t believe that the earth could dream up. It’s true, unicorns live in Crested Butte and fairies live in Bryce. 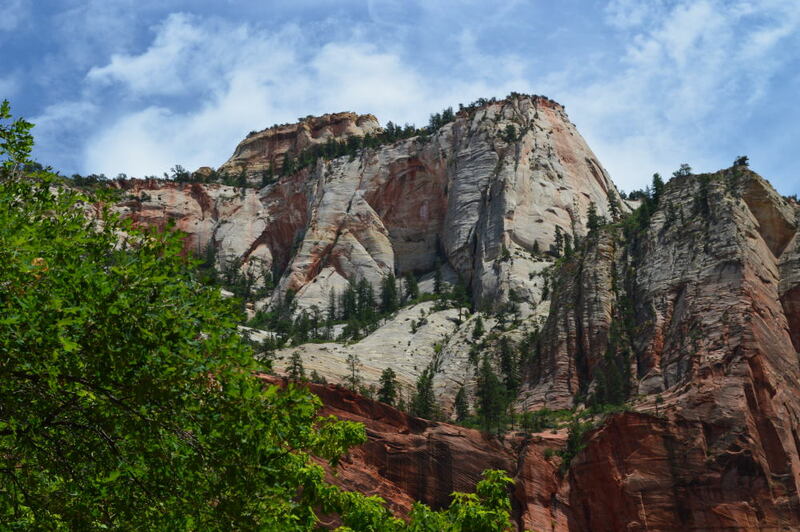 Given the heat in neighboring Zion National Park (despite their proximity, Bryce is at a much higher altitude than Zion, making the weather much more tolerable for camping), we decided to head to Zion for a day trip and continue camping at Bryce. For many reasons, this was definitely the right decision. Zion is absolutely beautiful and it seems as if everyone has already caught on to this fact. The place was a zoo! Even with most of the park outlawing cars and requiring that you take a shuttle, each hike we did was not all that dissimilar to being at the mall on a Saturday afternoon. And it was hot. It was beautiful, but it was hardly a wilderness experience. I’m sure that if you embarked on some of the longer or more challenging hikes, you’d find some semblance of solitude (or at least it’d feel like a mall on a Tuesday evening instead of Saturday afternoon), but given that the temperatures were above 100 degrees much of the day and we’d been hiking every single day for the past week, we did not attempt any of the more strenuous hikes. This would be a great place to come in the off-season, but one day was plenty for us during the heat and crowds of the summer. 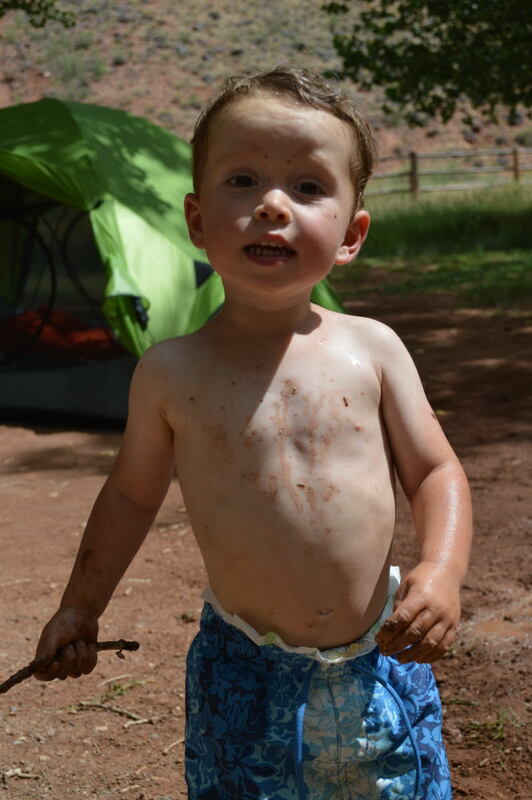 All that being said, I’d love to return when Van is a bit older and take on the Narrows trail, a sixteen-mile long trail through a slot canyon, at least 60% of which involves walking, wading, or swimming through water. The strangest part for me was that I had been to Zion once before during the summer of 1991. This was absolutely nothing like I remembered. It’s almost as if I’d been somewhere else and convinced myself that it was Zion. It was very strange returning somewhere I know that I’ve been and where I hold, what I thought were, pretty clear memories of what I had seen. It felt as if I were peering through a looking-glass much of the day, and it re-emphasized the importance of journaling and photographing the many places that we see during this journey. Flash floods in Capitol Reef National Park in south-central Utah closed down the main scenic road in the park and changed our plans to hike through slot canyons. 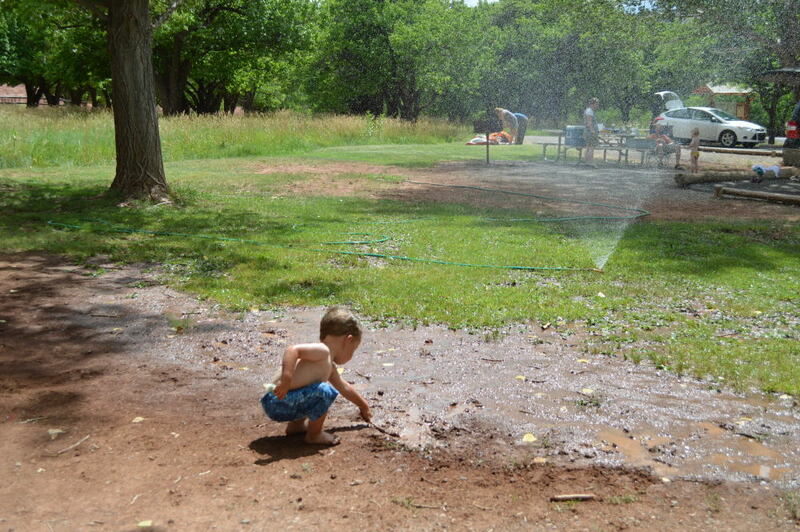 Instead, we cooled off in the campground sprinkler and again in afternoon thunderstorms. Though we did check out some areas of the park, we were never able to visit the more well-known portions of the park since the road remained closed to allow crews to remove debris that was funneled through the canyons and deposited onto the road. No matter; we enjoyed the opportunity to relax after a week full of hiking in the hot sun in Mesa Verde, Canyonlands, and Arches. 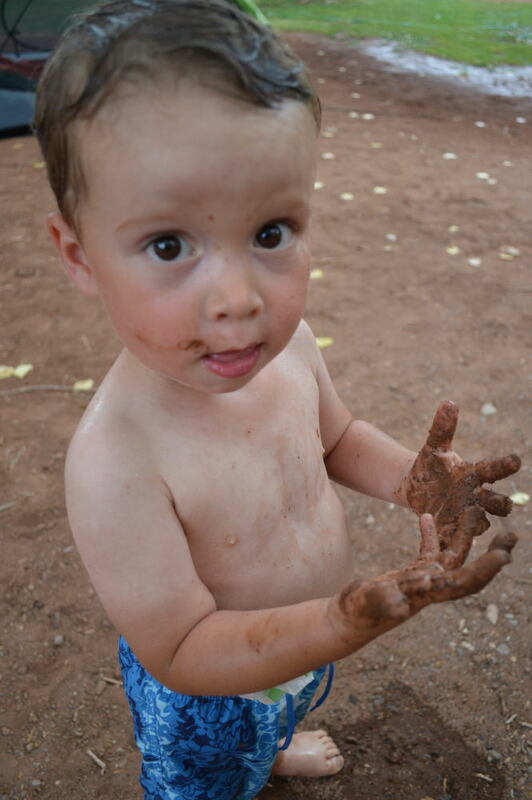 Think I Need to Wash My Hands? Arches was hot, beautiful and hot. We debated even heading to this area during July, but decided to give it a go, strategically choosing to camp at a higher elevation and therefore a lower (thank goodness) temperature. I would have loved to have spent more time in Arches, but one long day hiking under the blazing sun was enough for me. I was actually shocked we were able to fit so much exploration in to our long day in Arches, and my desperate cravings for damp shade during the several days after our visit just served to highlight that point. Since we knew that the longest hike we’d be doing was to the famous Delicate Arch (seen a Utah license plate lately? ), we zipped right to the trailhead to try to beat the mid-day heat. It was a beautiful, albeit crowded, hike, but the payoff at the end was well worth the crowds. The arch is stunning, and seeing a zillion and one photos of it before ever setting foot in the park did not diminish its beauty one bit. Standing (and then laying) under it was even cooler! Just writing about Arches is making me feel hot, so I leave you with some photos from our day in the sun while I try to locate some ice water. 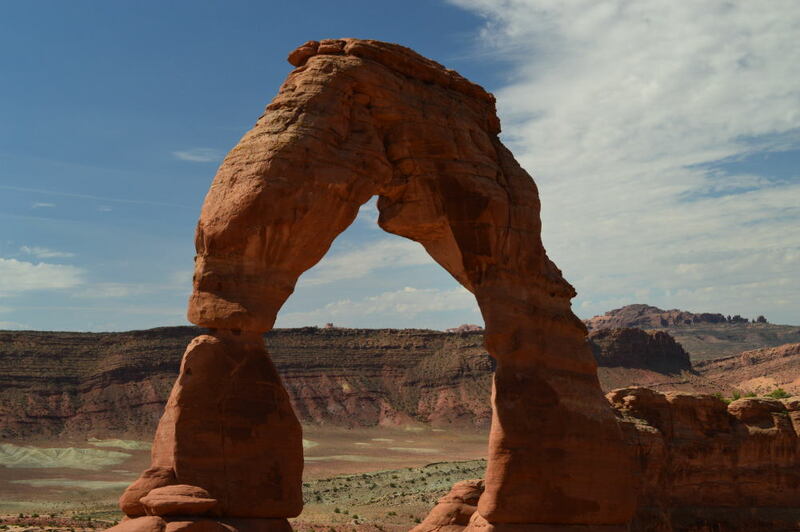 Delicate Arch is one of many. Here are a few other images of our exploration in the park.